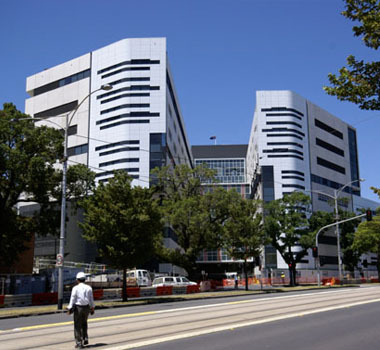 Due to open its doors in June 2008, the new $250 million Royal Women’s Hospital (RWH) in Melbourne will offer specialist women’s medical and maternity services, as well as a new world-class Research Centre, to the women of Victoria in a brand new state-of-the-art building. Located next door to The Royal Melbourne Hospital, the new RWH will be strategically placed to offer Victorian women services specifically designed for them, along with better access to The Royal Melbourne Hospital’s critical care facilities. The Royal Women’s Health Partnership, led by Bilfinger Berger with builder Baulderstone Hornibrook commenced construction on the new 40,000sq.m RWH in April 2005. A.E.Smith is proud to have been awarded the Mechanical Services contract installing approximately $18 million of air conditioning equipment, utilizing numerous specialist subcontractors and suppliers, of which Fantech has played a significant part in delivering this project to the State of Victoria. An integral part of the three year construction process was to ensure adherence to environmental measures such as water saving and waste minimization. 90% of all waste from the site (such as wood, scrap metal, glass and cans), is being recycled. The new RWH will retain its status as a major teaching, training and research hospital, providing world-class care for women of all ages; obstetric and gynaecology services, reproductive services, sexual health services and cancer services. Each year, the Women’s will deliver more than 5000 babies, care for over 2,000 premature and ill babies in their neonatal intensive and special care nurseries, perform 11,000 same day procedures and carry out 12,000 operations. The new hospital has been designed to meet the needs of women: birthing suites will be equipped with large beds, ensuites and baths and many of the little touches that will enhance the birthing experience. The new RWH will offer women choices in options for care, continuity of care and carer and control over the decision-making process. The new Royal Women’s Hospital – building a healthy future for women.